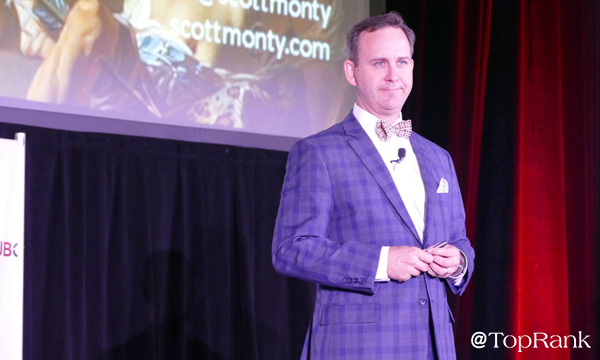 Scott Monty brought his nuanced and precisely-paced neoclassical style of marketing to Pubcon Pro Las Vegas 2018, leading off with a Longfellow poem — a refreshing non-technical respite from the buzzwords otherwise pouring forth from most presenters at the tech-savvy conference, as he delivered a mainstage address about social media, trust, and personalization. Scott, who was a classics major, began by noting that much of human nature is constant all around the world, with people holding the same shared motivations, including many great human truths behind what we do that still apply today — perhaps more than ever. We’re faced with a huge trust deficit, however, as confidence among us in general has plummeted, which Scott sees as a primary gap to be filled. Singling out Facebook’s near-daily barrage of breakdowns in trust, Scott pointed out that instead of focusing only on re-establishing its foundation of trust, astoundingly the social media giant chose to launch its Facebook Portal in-home camera product, and asked why it comes with a lens cover if people trust your brand. Amidst the backdrop of Google Plus closing shop except for certain enterprise users, Scott said that we currently see an average of some 3,500 brand messages daily, from the logos on our phones to the seemingly-endless variety of ways to get in front of our eyes, and asked how we as marketers can ever hope to break through when there isn’t trust for our brand. With the average amount of time spent online continuing to increase, especially with mobile’s rise, Scott asked the Pubcon audience if they knew who has warned of an overwhelmed and distracted brain on information overload, preventing us from doing the things that truly make us human, and then gave a surprising answer. Scott, donned in his trademark suit and bowtie, was talking about sixteenth-century Swiss naturalist Conrad Gessner, who wrote about the dangers of the Guttenberg printing press more than 450 years ago. Fear isn’t new, Scott said, and as such now we face an overabundance of content that has created a trust deficit. Scott pointed out that what we were once promised was, “It’s all about you,” with the consumer having the power when it comes to conversations with brands, but asked whether we have truly delivered on that promise. Taking a close look at human nature’s self-involvement, Scott asked what the 250 or more people who have died taking selfies since 2011 says about us, also using an example of Narcissus and Echo — including a slide featuring the famous 1903 John William Waterhouse painting. How can we reconcile all this, with many brands today also so focused on themselves, creating a wall between people and brands? Scott singled out personalization as one of the most important ways to make things relevant to people once again, and said that can begin for brands by simply knowing and using a customer’s name. Scott said that an equation of trust is needed, leading to a healthy customer relationship and to brand loyalty, but that this requires a frictionless experience, otherwise in today’s world where time is so highly valued, your customers will quickly go to someone else. Putting yourself in the other’s shoes is something Scott recommended, along with asking yourself just what makes your customers tick — what do they think about? Are You A Norm Or A Cliff? Scott used the “Cheers” TV show characters Norm and Cliff as examples, with all of us now in some ways being both simultaneously — Norm, known by all including where he sat and what his order was, and Cliff the know-it-all, who we’ve all also become thanks to having almost all answers at our fingertips thanks to search engines. In this era, where your customers may know more about some aspects of your brand than you do, how can we make them feel welcome? Scott showed logos of the thousands of social platforms we can use today to engage and manage customer interactions, and then shared an example of the dreaded but still all-too-common “Hello [First Name]” message greeting. With your customers using so many platforms, a major obstacle is knowing the various handles they’re using on different social properties, and Scott asked how we can learn them all, so that the conversation between brand and consumer can continue no matter the platform. Scott said that we should seek out the challenges and look for what’s disjointed, so that we can then work towards much-needed consistency, with the same quality personalization across all platforms. Solving these problems is a lot like a “choose your own adventure” story, and he suggested that there is science behind the analogy, with a map of the choices from these books looking just like a logic tree that is great for learning about customers. He said also that Netflix is a perfect example of bringing this type of personalization to content, with its upcoming “Black Mirror” season featuring choose-your-own-adventure elements that will allow the streaming giant to learn a lot about its customers. It’s a return on value, however, Scott pointed out, as Netflix will be giving us what we want based on our behavior, and said that marketers should work to connect disparate data, understand it, and only then act on it. Customers will only give you so much information, he pointed out — sometimes just providing a last name is where this can drop off — so the less you can ask for the better at first. 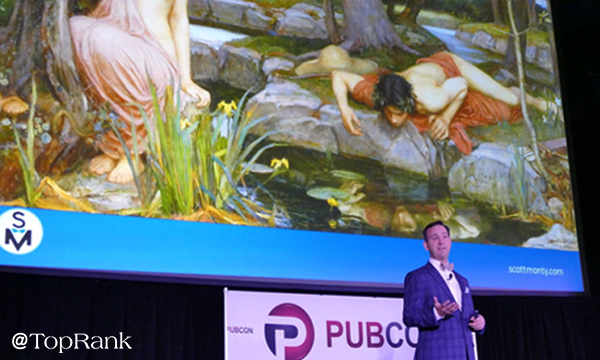 “The sweetest thing in the world is the sound of your own name,” Scott told the Pubcon crowd, and used a Tom Fishburne Marketoonist cartoon as a humorous example of the challenges brands face in personalization today. Scott was once the head of social for Ford, and he told the Pubcon audience a story about customers asking for more room in truck beds, engineers giving them more room by building higher bed walls, followed by customers complaining that they couldn’t reach all the way down into the beds any longer, eventually leading to the inclusion of the little step now commonplace among trucks. It’s important to observe how people engage with your content, and to make smart decisions to personalize things, he added, also pointing out a study showing that the open rates of non-personalized e-mail is 13.1 percent, but just by adding a first name that figure generally jumps up to 18.8 percent. Can You Make Someone Cry Using Six Words Or Less? 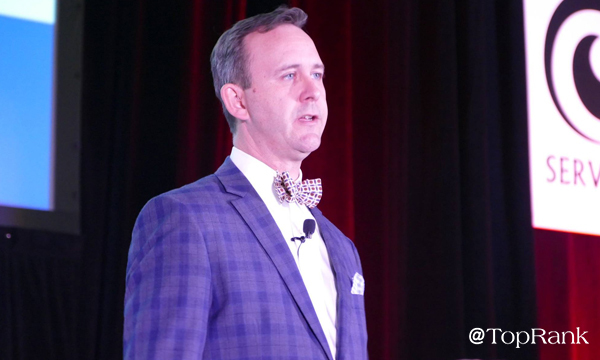 Scott pointed out a May 2018 eMarketer study showing $150 as the amount most consumers would take to hand over their personal data, but urged us to look beyond the mere data to uncover the stories behind the numbers. Stories are inherently emotional — they’re human and have been a part of us since the dawn of time, Scott explained, sharing the story of Ernest Hemingway’s famous $10 bet to achieve a meaningful story in six words or less. “For sale. Baby shoes. Never worn.” won the bet, and choked Scott up slightly as he said the words — big emotions from only a few words. 71 percent of consumers have left brands because of poor customer service, Scott said, questioning whether all the time we spend on acquiring new customers is always the best choice. People want power over their own decisions, and some firms have succeeded by taking this to heart, he said, including Dollar Shave Club and SodaStream, “out-Amazoning” Amazon using frictionless and personalized models than offer plenty of convenience, certainty, control, and customization. Scott ended his Pubcon presentation as he began, with a poem, and then stayed to answer questions from a large group of attendees. 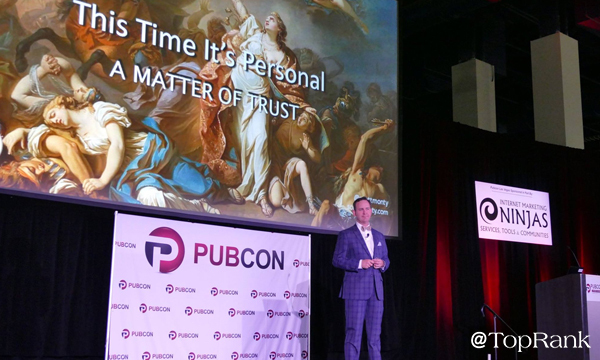 If you missed Pubcon this year, or weren’t able to make it to all the sessions you wanted to, be sure to check out the rest of our Pubcon Pro live blogs here.